Raft building is a very popular activity. It makes a great addition to a water based activity day or a a stand alone activity for a morning or afternoon session. 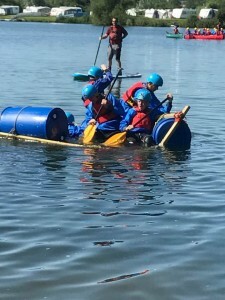 Raft building involves a team of people building a raft out of logs, barrels and ropes. e usually build two rafts then race them to see who gets to the finish line first. During the session you will learn a number of useful knots and play lots of games on the water. Raft building is competitive and always fun, especially when the first raft falls apart. We can bring the building kits to a number of locations, Devils Bridge at Kirby longsdale is a popular choice, Lake Windermere and Ellerton Lake Catterick are just a few of the usual spots. 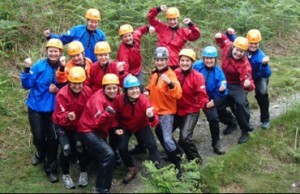 All offer fantastic scenery and opportunities for jumping in and having a great time. 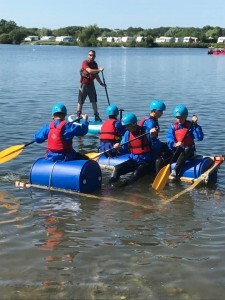 Raft building is £45 per person as a stand alone session if you would like to add canoeing or stand up paddle boarding to make it a full day its £69.